Familiy Ties Rocky Santana is the son of El Diablo Rojo, the brother-in-law of Gallego, the husband of Neftali and the brother-in-law of Reyna Gallegos. Trainer Was trained by Al Galicia, Felipe Ham Lee and Villano I. 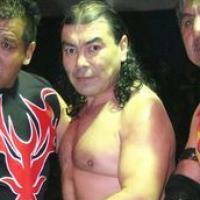 Students Trained Ángel de la Noche, Cerebro Maligno, Chica Pantera, El Creyente, Demonio Gato, Demon Rocker, Estrella Negra, Eterno, Extasis, Golden Fire, Jorge Kebrada, Kamilion, Kechanguito, La Metálica, Misterio, Mr. ATL, El Psicópata, La Reina del Sur, Rey Krimen, Robin Maravilla, Sadico, Sangre de Lobo, Sky Fly, Stryker, Terry Dos Mil, Tóxico and Yoruba.